We value our patients' experience at McIntyre Family Chiropractic. If you are currently a patient, please feel free to complete the following Client Experience Questionnaire or simply click the link below to leave us a Review. The Questionnaire is in Adobe Acrobat format, and requires the free Acrobat Reader to view. When we first learned that our baby was in the breech position at 31 weeks, our midwife recommended that I go see a chiropractor familiar with the Webster technique. Having never been to a chiropractor before, I was a little uncertain about what the experience would be like, but it was important to my husband and me that we use all available resources to give us the best chance of having a natural childbirth. I called Dr. Sean's office the next day. His friendly staff put me on the phone with him directly and we scheduled an appointment for the next business day. Dr. Sean was very patient, answered all of my questions and did a small adjustment during the first visit. For the next two weeks, I visited his office every other day to receive adjustments based on the Webster method. The adjustments were gentle and comfortable with Dr. Sean paying extra attention to my baby's and my safety. At my next pre-natal appointment, the baby had turned head down and was in optimal birthing position! My experience with Dr. Sean has been so positive that I continue to see him weekly for pre-natal adjustments, and plan to keep doing so postpartum. My family and I are so grateful to Dr. Sean for his excellent care and would recommend him to anyone. I am a 52 year old woman of excellent health. I am active and spend 3-4 days a week in a gym either lifting weights or attending a class that includes isometrics and stretching. I also have scoliosis. Prior to becoming aware of Dr. McIntyre and his practice, I saw a great Chiropractor that I trusted very much for about 13 years. After, what I believe to be a slight injury occurred making my lower back pain more severe than normal I sought out not only my regular Chiropractor, but also an Orthopedist to evaluate my pain and discomfort. I went to PT with a Physical Therapist for 6 weeks- twice a week to try to correct the problem. The stretching did help somewhat but I really did not get the relief desired with the therapy or with my existing Chiropractor. I received some information about Dr. McIntyre through interest in getting a massage at his office and was able to schedule an evaluation and an x-ray before my appointment. The few minutes that I spent with Dr. McIntyre on that first visit, along with his explanation of my x-rays which showed a significant curvature of the spine (diagnosed as scoliosis), impressed me to make an appointment for an adjustment. I have been going to Dr. McIntyre’s office for 9 months now. I have made a conscious decision to continue my care at his office and not to return to my former Chiropractor because of the increasingly great results of his care and constant evaluation of my comfort level and ability to function well and without significant pain as I go through my daily routines. While everyone has individual needs and a level of care that Dr. McIntyre can provide based on your particular situation, my experience has been a very good one and I highly recommend him to anyone that is seeking a Chiropractor that is personable, knowledgeable and able to provide individual attention that is effective and will put you on a path to increasing recovery. In my case, the goal is realistic and not to “cure” my scoliosis but to relieve pain and find ways to start reversing the problem rather than increasing the probability of it worsening over time. I have recommended Dr. McIntyre to friends and family and I recommend him to you as well. I have been a patient of Dr. McIntyre’s since August of 2011 and I can 100% say that it has changed my life! I am a dancer/choreographer and over the years have done a lot of damage to my body. In 2008 I had to have major abdominal surgery. In 2009 I herniated a disc in my low back, which resulted in a microdiscectomy in 2010. Immediately after recovering I found out that I was pregnant, and gave birth to my daughter in the spring of 2011. Needless to say, when I came to Dr. McIntyre in August, I was so stiff that I could barely move. I was in constant pain and discomfort, which was interfering with my job as a dancer and as a new mother. After a very thorough consultation, Dr. McIntyre recommended a wellness plan that worked with my schedule and budget. I started with three weekly adjustments. My body started responding immediately! In addition to adjustments, Dr. McIntyre suggested massage therapy with Amanda Croft. She is by far the best massage therapist I have ever worked with. I feel that getting massages have helped my body respond to and hold each adjustment. After just one month of treatment, the results were amazing! My stiffness and pain diminished significantly and my flexibility started improving. By the sixth week of treatment, I was able to cut back to one or two adjustments a week and a bi-weekly massage. I have continued to improve with every adjustment and now only need to be adjusted about every 14 days. I feel SO much better! I am able to dance again, and take my daughter on long walks without being miserable! Having been to many chiropractors, massage therapists, orthopedists, etc., I can truly say that McIntyre Chiropractic is the best! Dr. McIntyre actually listens to his patients and genuinely wants them to feel better! He actually cares! His entire staff is so nice and always willing to go the extra mile to accommodate their patients! I also can’t say enough about Amanda Croft! She, too, has listened to me and taken a very active role and interest in healing me. I believe that the combination of knowledge, expertise and compassion of Dr. McIntyre and his staff is what separates them from the rest! THANK YOU to Dr. McIntyre and his staff for helping me get my life back! Over the past twenty years we have been committed Chiropractic Patients. About two and a half years ago we moved to Atlanta and unfortunately had gotten away from our regular routine of Chiropractic care. One of the main reasons was the inability to find a chiropractor we felt comfortable with. Over the past few months I was once again experiencing significant lower back pain. This continued until late in October when my back finally gave out. It was late on a Sunday and I was having trouble standing up straight and by the next morning, I could barely get out of bed and get dressed. Needless to say I went to work and subsequently had to have my wife Michele come and pick me up. Prior to Michele coming to pick me up she phoned Dr. McIntyre, who had previously been recommended to us. Michele spoke directly to Dr. McIntyre and he offered to take a look at me right away. I would have to say one of the more impressive things upon entering the McIntyre Family practice, was the professionalism of Dr. McIntyre, Dr. Hastings and the staff. Upon arrival, it was necessary for me to hold on to someone or something in order to walk. Dr. McIntyre worked on me for four straight days and by Friday of that week I returned to work. It took about three weeks for me to start feeling like I was back to normal and I thank Dr. McIntyre for the care and progress that I have made. experienced as a young adult when going to a Chiropractor to treat his asthma. We have two daughters one of which has a rather serious asthma condition. 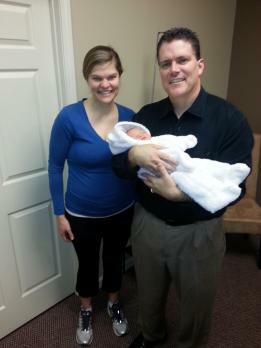 After hearing Dr. McIntyre's, we decided to have both our daughters start regular Chiropractic care. Now they fight to see who gets to go first. Ironically enough we were also looking for a new multi vitamin or vitamin supplements. Dr. Hastings was extremely knowledgeable and helpful in assisting us in designing a program to fit not only our needs but our daughters as well. I was 13 years old when I was diagnosed with Scoliosis and a lack of a C curve in my neck. I started Chiropractic care and continued once a week visits for the ten years that followed my diagnosis. In spite of regular care that I was receiving, I never held my adjustments longer than a few hours. My body would slip back into its comfortable out-of-alignment place, and I would be doing crazy twists and bends "trying to stretch out the subluxations" again before the end of the day. In my early 20's I moved from my home in New Jersey and decided to abandon Chiropractic care. I thought that the very temporary relief wasn't worth the doctors' visits and that I would see how I could fare without it. When I moved to Atlanta in 1999, I tried out the student clinic at Life University. The price was right for a gal whose insurance wouldn't cover Chiropractic, but the adjustments still weren't holding. I gave up again. I met Dr. McIntyre and the Wellness Center staff at Southern Polytechnic State University's Health Fair this past March. I explained to him that I had lived with this constant discomfort for so long that I didn't know how to feel any differently. Dr. McIntyre convinced me to give him and his staff a chance. I was still a little skeptical, despite my obvious need for chiropractic care, but I decided to go for the consultation.. Within a month my spine was holding adjustments for several days at a time. Dr. McIntyre used different methods than I had experienced in the past, like the Artho-Stim and the traction table, to give me longer relief between adjustments. I was feeling happier and more flexible! I was also finally convinced, after 18 years of the wrong type of care for me, that sometimes it just takes the right doctor and the right methods to produce results. The entire staff is incredibly caring and professional! Everyone knows me by name and asks how my day has been. That means a lot! Now that I'm moving away from Atlanta, I will be forced to search high and low for a new Chiropractic office that will help me to continue my progress as effectively as McIntyre Family Chiropractic. I have a feeling that will not be an easy task! My name is Jackie and for 8 years now I have suffered from lower back pain. At times it was to the point of taking 30 minutes to put clothes on. Due to the pain, I had to stop doing yard work, playing golf, and any physical activities. For the last 8 years I had a Chiropractor I used, but the progress and/or stability was not there. I became frustrated with the situation. A co-worker referred me to Dr. McIntyre as an option for possible relief. I came to Sean in September of 2006. At my first visit with Sean within 10 minutes of consultation I already heard a more positive approach toward my problem than I've had in the last 8 years with my other Chiropractor. Right from the beginning I could tell Sean was more interested in my well being than just having a new patient. We discussed my job and daily activities that had to be considered for my situation and treatment. He makes sure treatment is not a financial burden as well. After the first month of seeing Sean, I started seeing and feeling improvement. He gave me exercises, stretches, and new adjustment techniques that we could do in the office and at home. I'm back to playing golf and enjoying the things I had to stop due to my back pain. Needless to say coming to Sean was the best move I made for my back and overall physical outlook. McIntyre Chiropractic boasts a friendly, professional atmosphere. I'm greeted each time with a smile and concern of my condition. All the staff makes an extra effort to do things to show their appreciation for your presence. Our family has been getting chiropractic care for about 12 years. We had not been consistent in our care until last spring. Our 10-year-old son began to have severe asthma attacks, and he was constantly using his rescue inhalers. He missed so many days of school that his principal contacted us. He also missed out on many sporting activities because of his asthma. This was devastating for him, because he absolutely loves playing the "sport of the season". After discussing his asthma condition with Dr. McIntyre, he came up with a chiropractic plan. He began his three adjustments per week plan in April of 2006, and we continued this schedule throughout the summer. The new school year began in August 2006, and this was typically a difficult time of year for him. His immune system was low, and as soon as he came in contact with a cold germ, he would catch the cold and it would go straight to his lungs, resulting in an asthma attack. As the fall semester progressed, we noticed that he was not having as many asthma episodes. When he did have trouble breathing, the duration was shorter, and he recovered much quicker than before. On one such occasion that he had an asthma attack, he even asked to go see Dr. Sean. Of course it was on a Thursday, the day they are closed. After a quick phone call, Dr. Hastings was happy to let us come in. After the adjustment he said he felt instant relief- he was a different child. He still manages to catch the occasional strep throat or bug; however, it doesn't affect his asthma like it used to. I have no doubt that the chiropractic care he has received from McIntyre Family Chiropractic is responsible for the improvement in his health. In conjunction with the regular chiropractic adjustments, he began taking the whole food vitamin 'Catalyn' along with Echinacea-C in the fall of 2006. He seems to respond to these, as he is not getting sick as often. We also noticed a significant improvement in the side effects he was experiencing with each illness, primarily stomach cramping and irregularity. Our entire family has benefited from Dr. Sean's care. Our daughter dances for a local ballet company five days a week, and she has significant foot issues. Thanks to Dr. Sean's knowledge of the foot, he has been able to adjust her feet on a semi-regular basis. This allows her to continue her dancing with much less pain. John and I continue to get our regular adjustments. This helps us maintain a healthy system, so we can keep up with the demands of our busy children's schedules! Being able to manage pain without the daily dose of drugs? I never believed that it would ever happen again. Ten years ago I was diagnosed with Sarcoidosis, a chronic autoimmune disorder that causes inflammation in my organs, glands and joints. As my disease progressed the pain in my body and joints grew greater and more constant. How did I cope? You see I became adjusted to my pain levels with the aid of drugs. I got used to feeling the pain! Now if you ask me that's crazy!! My original Doctor gave me a warning-Medication is only a band-aid covering up your symptoms. I spent years rotating on and off, Advil, Aleve, Viox and Celebrex until I started having other problems caused by the medications, heart problems, stomach problems, ending with a visit to my specialist with swelling and pitting of my legs and ankles. No more Advil or Aleve (the only drugs that I was still allowed since Viox and Celebrex were discontinued). Tylenol was all that was left. That lasted 6 months, and then my doctor told me I could only take it when the pain was "real bad". Who was he kidding?. . . The Tylenol hardly helped anyway. Boy, was I miserable! It was soon after that my employer held a health fair and I met the gang from McIntyre Family Chiropractic. Jenney gave me a sample massage-boy did that feel great! The Doc's sat down and discussed my illness with me. 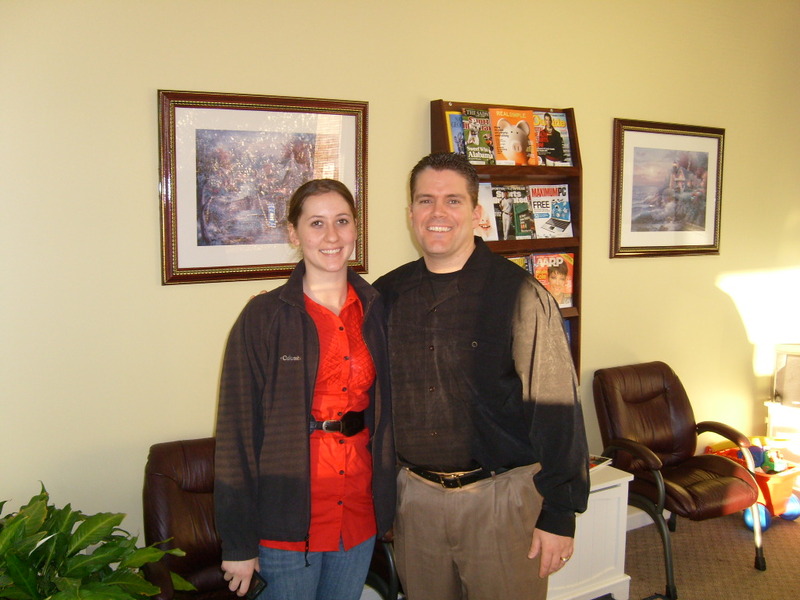 Then I went for a free consultation later that same week and began my adjustments soon after. I also have Therapeutic Massage sessions with Jenny and in the short time I have been a regular here I am happy to report that my pain has diminished. I am comfortable on a regular basis. I forgot what it was like to be pain free. I've found I'm happier, not realizing that I even shut down my emotions in trying to live in daily pain. Today, I feel better than I have in ten years, I have more energy and most of all I have hope. The hope and knowledge that I can continue to participate in life-Pain Free!! Thanks for giving me my life back! I nearly lost my life before it started. At four and one half months I was in a car accident in Israel. A young Arab driver ran a stop sign and plowed into my parents' VW bus. The year was 1973. The time was right after the Yom Kippur War. My family's car had been commandeered by the Israeli Army while my parents (American grad students at the time) were out of the country visiting relatives in the United States. The VW bus they purchased on their return had no rear seats and my mother was holding me. I experienced severe injuries to my face and arms and my left leg was broken. My skull was slightly deformed from the impact of windshield. Miraculously I suffered no brain damage or serious eye damage. Apart from some scarring around my left eye (my eyelid is entirely reconstructed scar tissue) I have no noticeable reminders of my close call with death. The best surgeons in the world were in Jerusalem to cope with the combat casualties. So I received some free world class plastic surgery for which I will always be thankful. Ironically, my lasting reminder of that day is not the scars but the impact it had on my spine. My left leg, fractured at such an early age, grew 17mm shorter than my right. This has permanently offset the balance of my hips, causing my spine to tilt left then right and then left again causing spinal scoliosis. This became a real problem for me in my early 20's and I sought out chiropractic care then and most of my issues were corrected in about a year. I then went without chiropractic care for several years. My experiences caused me to study the spine and its healthy maintenance carefully. I maintained my spinal health with diligent use of yoga asanas and stretching. However these were not enough by themselves and I realized that I had a chronic problem that required outside help. After moving to Atlanta, I searched for a new chiropractor for over 3 years. After trying many others I finally settled on McIntyre Family Chiropractic. Sean and Ian are the best I have found in Atlanta, GA.
With their help I have been able to greatly minimize my scoliosis and its effects. Already I am hugely improved. I plan to be symptom free within one year. In closing I would say that chiropractic is a therapy and a wellness program suited for chronic conditions or injury. It requires commitment much like an exercise program or a sensible diet. The ancient yogis believed that you are as young as your spine and modern medicine has shown that longevity and mobility go hand in hand. With Sean and Ian's help I'll be staying a lot younger a lot longer. In December 2005, I was in a serious auto accident while driving to Chattanooga from Atlanta. At a speed of @ 75 mph, my Land Rover hit a patch of oil on a rainy evening and I lost control of the vehicle. The truck flipped six times, hit a tree and landed upside down in the median. Miraculously, I walked away from this horrific accident with only bruises from the seat belt-or so I thought. The Ambulance EMT and doctors at Kennestone WellStar Hospital both told me I was fine, and I went home a thankful person. After the bruises healed, I did notice back and neck pain, but as I sit at a desk all the time, I thought this was the cause. Over the next year, the pain became increasingly worse. It seemed nothing I did helped. I spoke with my regular care physician and was told to get more exercise. While this was certainly a good idea, it did not help the pain. In January 2007, I started looking for a chiropractor. I visited several, who shall remain nameless, until in March of 2007 I finally found Dr. McIntyre. Six months later, it is a different world. No more pain. Dr. McIntyre found that my ribs were dislocated from the breastbone-no doubt caused by the seatbelt impact at 75 mph. 15 months of no treatment meant other problems had occurred as a result of this injury, and it has taken a while to track it all down. Nevertheless, Dr. McIntyre has done it. He diagnosed the problem almost immediately, and has been systematically and effectively treating it ever since. He must undo the months of maladjustment caused by the accident, and this takes time. Had I come to him within a few weeks of the accident, I'm sure I would have been saved months of constant pain. I have to be consistent about my treatment, and make certain I come in for chiropractic care whenever I notice any pain. Already I can tell this will be permanently healed in a few more months. And thanks to Dr. McIntyre, I am well on the road to years of pain free life. Over the past 35 years, I have had occasion to visit a number of chiropractors from time to time. I have had the privilege of being treated by some extraordinary doctors of chiropractic, John Thie, Walter Schmidt and Kent Goode among them. I have never known a better practitioner of chiropractic than Sean McIntyre. My name is Kaylynn; I have been dealing with lower back pain for over a year due to a degenerated disc. I did competitive cheerleading for about 7 years and had always enjoyed being active. When I first noticed the pain I tried to ignore it and just continued with my normal activities. The pain continued to get worse; it got to the point where I would go home at the end of the day and just lie down, waiting for the pain to get better. The pain got so bad I had to quit almost all physical activities. I was no longer able to even sit through an hour long class let alone a 2 ½ hour class. I had seen many doctors who all tried to help the same way, with pills or shots. Nothing was really working or lasting more than a few hours. When the doctors started talking about surgery I thought it was time to try a new approach, and that's when I came to McIntyre Chiropractic. After just a couple weeks I could tell a difference in my pain levels. The pain had decreased; I was no longer dying to get home so I could lie down. As I continued coming I was starting to have pain free days, which I hadn't had in over a year. I was even able to sit through class longer. Now after only a few months I am mostly pain free and can do my normal activities without pain. Even sitting though a 2 ½ hour class is not a problem any more. Coming to McIntyre Chiropractic has been the best thing for me and the only thing that has worked. The people and service are great: every time I walk in the door I am welcomed with a smile. There is a great professional atmosphere here and the McIntyre family staff truly works in the best patient's best interest and overall well-being. We first visited McIntyre Chiropractic in May 2010. Our 10-month-old, Charlie, had been suffering from chronic ear infections for 6 months, and after several rounds of antibiotics and even surgery to place tubes in his ears (all of which were ineffective), we decided to try chiropractic treatment. I am thrilled to report that since Dr. McIntyre began treating Charlie in May, he has yet to have a new ear infection - for over 3 months now! He is clearly a happier baby and is sleeping so much better as well. We couldn't be happier with his results! Charlie's big brother Luke (age 4), is a huge fan of Dr. McIntyre. Luke is completely at ease with every adjustment, and he is always so excited to see his "favorite doctor" because "he doesn't have any shots!" Both boys are so comfortable with Dr. McIntyre--he is so good with kids, and they absolutely love coming to see him. Of course, working full time with two small children has taken its toll on mom as well. This one has been particularly tough one for me at work, with long hours and lots of stress. I began getting regular adjustments in June to treat the tension I've experienced for years in my neck and shoulders. In 2 months, I've noticed a significant reduction in pain and tension, as well as overall improved posture. I've also been able to better manage stress levels, and have a generally feel better even with the added workload. We've been so pleased with our experience at McIntyre Family Chiropractic-the friendly staff, wonderful doctor, convenient hours, and fast & efficient service which is also very attentive to our needs-we cannot thank you enough for everything you've done for our family!